Anyway, I decided to make pull apart bread because... SWEET, CINNAMON-SUGAR BREAD. And you just pull them apart like sheets of paper! I used a slightly adapted recipe from here. I didn't even have the ingredients to make a glaze, but it didn't need it (and you'll feel less guilty). I'm so glad I tried this recipe because it was SO DELICIOUS! So much in fact that it was gone by the end of the night hehe. My grandma and dad paired it with their morning coffee and tea, but it is also great paired with milk. There's something about pulling cinnamon-sugar bread apart and having a cup of cold milk that just screams KID! It just hits the spot. YUM! In your stand mixer, mix 2 cups flour, sugar, yeast, and salt. Set aside. Whisk together eggs. Set aside. In a small saucepan, melt milk and butter until butter is melted. Remove from the heat and add water. Let mixture stand for two minutes, or until the mixture registers 120 to 130°F. Add vanilla. Pour the milk mixture into the dry ingredients and mix. Add the eggs and stir the mixture until the eggs are incorporated into the batter. It’ll seem like the dough and the eggs are never going to come together. Keep mixing. Add the remaining 3/4 cup of flour and stir for about 2 minutes. The mixture will be sticky. Resist the urge to add more flour. Place the dough is a large, greased bowl. Cover with plastic wrap and a kitchen towel. Place in a warm space and allow to rest until doubled in size, about 1 hour. While the dough rises, prepare your filling. Whisk together the sugar and cinnamon and melt 1/4 cup butter. Set aside. Grease and flour a 9x5x3-inch loaf pan. Deflate the risen dough and knead about 2 tablespoons of flour into the dough. On a lightly floured work surface, use a rolling pin to roll the dough out. The dough should be about 12-inches tall and 20-inches long (I used a ruler to measure). Brush melted butter across all of the dough. Sprinkle with the sugar-cinnamon mixture. Slice the dough vertically, into six equal-sized strips. Stack the strips on top of one another and slice the stack into six equal slices once again. Layer the dough squares in the loaf pan, on its side. Place a kitchen towel over the loaf pan and allow in a warm place for 30 to 45 minutes or until almost doubled in size.... UGH I KNOW. We just have to wait a little longer. Preheat the oven to 350°F. Bake for 30 to 35 minutes, until the top is very golden brown. A dark, golden brown color will ensure that the center is cooked well. Remove from the oven and allow to cool. Invert twice so that it is right-side up on a clean board. Serve warm with coffee, tea, or milk! I like to activate my yeast before I mix so that it ensures the dough to rise. Whisk yeast into 3 tablespoons of warm water (between 105 and 115°F). Add a pinch of granulated sugar and allow the mixture to sit for about 5 minutes, until the mixture is foamy and frothy. Add to the flour mixture when you're just about to combine both wet and and dry ingredients. My family doesn't like nutmeg so I left that aside. You can add 1/2 teaspoon of nutmeg to your cinnamon-sugar mixture. When you're just about to stack the squares, it can get VERY sticky and might have a tendency to stick to your countertop. Make sure you are able to lift the dough before you add your filling! Best served the day is made... let's be real, will it really last longer than that? Enjoy! IT'S FRIDAY! That means I made it through the week and therefore I deserve a treat... right? Sure. ;) Anyway, I remember always eating Milanos when I was younger and the other day I was really craving some of these cookies! Everything is better homemade so I decided to try to make them at home. I used a slightly adapted recipe from here. I'm a little more into savory foods than sweet so I left a few cookies without the chocolate. You'll have to give it a try and see for yourself! Place the butter and sugar in a mixing bowl and mix on low speed until a creamy consistency. Incorporate each egg and vanilla extract one at a time and leave on high speed until it becomes light and fluffy. Remove from the stand and fold in flour slowly until just incorporated. Cut an inch off the end of a ziplock bag and place the batter inside. Pipe the batter onto the baking sheet, measuring 2 inches long. Bake in the oven for about 14-15 minutes or until the edges of the cookies begin to brown. Transfer onto cooling racks and repeat for the rest of the batter. Make sure to let the cookies cool completely before adding the chocolate. Separate the cookies into pairs of similar sizes and begin making your filling. In a double boiler, melt your desired chocolate (this is where you can add lemon zest, orange zest or mint extract). Let the chocolate sit and cool for 15 minutes before you begin making your cookies. Spoon onto one side of the cookie pair and place the other one on top. Repeat with the remaining cookies, let the chocolate set, and enjoy! Preheat your oven to 350° F. Place all your dry ingredients (flour, sugar, baking powder, baking soda, salt, chocolate chips) in one large bowl and stir to combine. 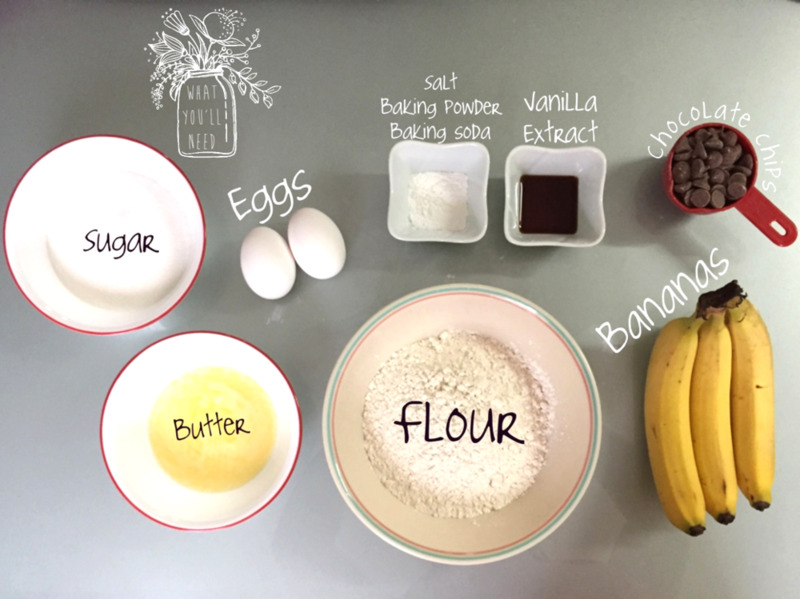 In a separate bowl, combine the wet ingredients (lightly beaten eggs, mashed bananas, melted butter, and vanilla extract).Slowly fold your wet ingredients into the dry ingredients until combined. Scoop the batter onto lined muffin tins and bake for about 25 minutes. Remove from the oven and let it cool for 5 minutes before you dig in! Brush the melted butter on top of the muffins then dip into the cinnamon sugar mixture! Happy almost spring! I'm one of those people who will drink an iced beverage anytime of the year, whether it's a smoothie or a cold lemonade. For example, this past winter, I ordered an iced coffee or an iced latte every time I went to a coffee shop. However, there are a few times during the season when I'm craving something warm and that happened to be the other day after I finished shoveling all the snow in my driveway. I decided to make homemade hot chocolate. YUM! After you taste it, you'll want to make it all year round! Make sure your heavy whipping cream is chilled. Pour the cream and the sugar into a bowl. Next, whisk your arms away. You could even skip arm day because you'll definitely get a workout by doing this. Keep whisking until soft peaks form. Next, in a saucepan, bring the milk to a boil under meadium-high heat. Once the milk starts boiling, lower the heat and add the chocolate and the cornstarch. Keep stirring until all the chocolate is melted and the cornstarch is dissolved. Pour your hot chocolate in a mug, spoon your whipped cream on top, stir, and enjoy! - I added the sugar because it gives the whipped cream a little added sweetness. - It helps if both the bowl and the heavy whipping cream is chilled before whisking. - If you'd like a slightly thicker hot chocolate, reduce your milk by 1/2 cup - 1 cup.